Update 6/24/2012: We have updated this post with additional locations where these are available – please go to https://www.theflightdeal.com/2012/06/24/updated-10-off-american-airlines-gift-cards-at-selected-costcos/ for updated locations. Selected Costcos across the country are selling $300 Gift Cards from American Airlines for $269.99, a 10% discount. As Costco only takes American Express credit cards, you also have an opportunity to receive AMEX membership reward points on top of that. Costco doesn’t charge sales taxes on gift cards, so this is a true 10% discount on AA.com. And if you’re a Costco Executive member, you will also get a 2% rebate, making this a 12% discount. 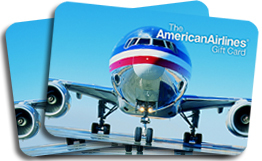 American Airlines Gift Cards do not expire. Another benefit of AA Gift Cards is that you can use up to 8 gift cards per reservation on AA.com or $2,400 at a time. In addition, AA runs a lot of promotional codes — you can stack those codes with the Gift Cards. You can also use them for all oneworld carriers (British Airways, Cathay Pacific, Finnair, Iberia, LAN, JAL, Malev, Qantas, Royal Jordanian, S7) and AA codeshare flights on AA.com. Here are Costcos in Chicago, Los Angeles, New York, San Francisco and Washington D.C. that reported to have the American Airlines Gift Cards in stock in the past 3 months. The Item Number for the American Airlines Gift Cards is 576515. You might want to call your Costco before heading there to make sure they have it in stock. If they don’t, ask them for the nearest store that does have the gift cards in stock. More information about the AA Giftcard — http://www.aa.com/giftcard. Other locations also have them, so call and ask. None reported — closest being Orlando. Call your friends in cities that have them in stock and buy some. 10% discount off AA.com from Miami would make some flights a deal. This combinable / stackable with the current Susan Komen Race for a Cure 10% off coupon found here. The coupon is good for travel from 9/7 to 10/4. If you are traveling soon, that is almost a 20% discount for fares up to $300.